Every Fall, I somehow miss my chance to go apple picking in some gorgeous Georgia apple orchard. While this year is no different, I did get to do a little persimmon picking at my sister’s in-laws’ persimmon trees. What is it? It’s actually a berry, but resembles a firm tomato or small pumpkin. Besides persimmon’s beautiful color that ranges from a light yellow-orange to a dark red-orange that’s perfect for Fall, the name translates to “divine fruit” or “the fruit of the gods.” Sweet, tangy and usually fibrous, persimmon is popular throughout Asia. But beware…not all all species of persimmon are the same. The Japanese hachiya is bitter and firm at first, but softens and sweetens as it ripens. 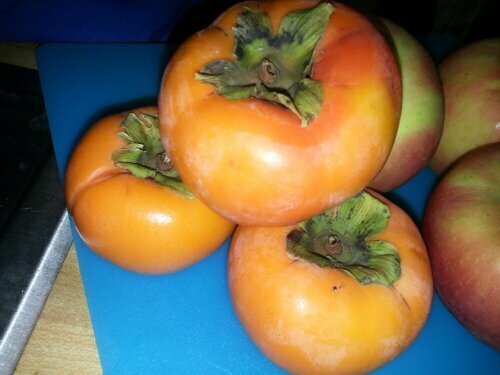 So unlike the fuyu persimmon, the hachiya specie must be completely ripe before consumption. Trust me on this one. 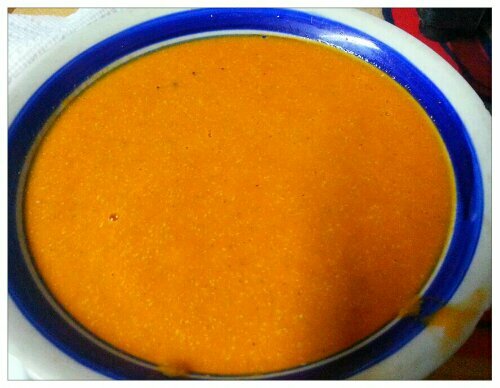 After a friend posted a photo of her homemade persimmon applesauce, she graciously shared her simple recipe. 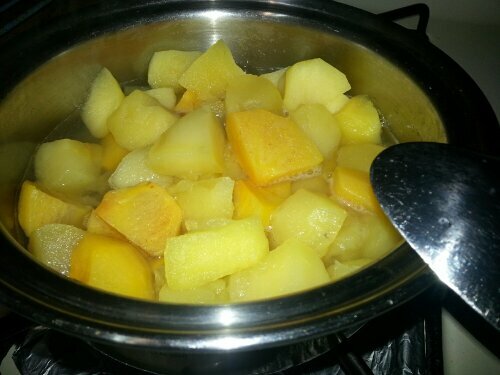 With just three ingredients: a handful of peeled apples, persimmon and about a cup or two of water (depending on your preference of consistency) plus a pot, persimmon applesauce is great for everyone! I peeled both fruits, but I know some people like to keep the skin on since that’s the layer where the most nutrients are. 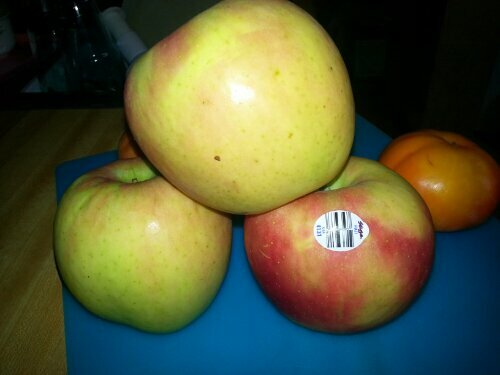 I used two giant apples and three persimmon, but feel free to use equal parts depending on how much persimmon flavor you want to include. Heat the fruits and water on high until it boils, then bring the heat down to low-medium and boil for another hour or until the fruits are tender. 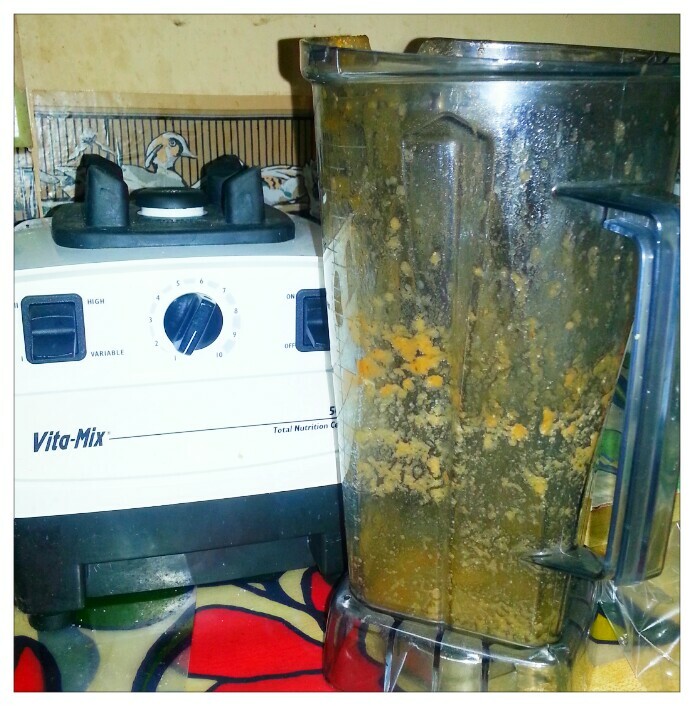 After the fruits have cooled, purée in the blender (or Vitamix), and enjoy! 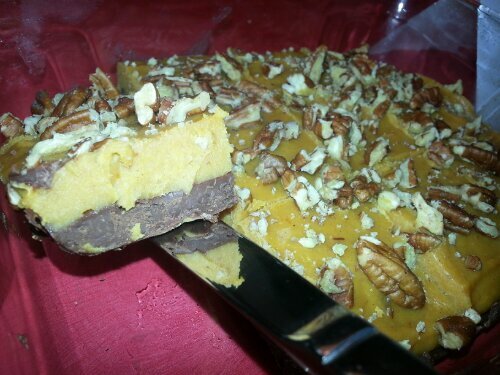 This recipe is simple, delicious and such a healthy treat. 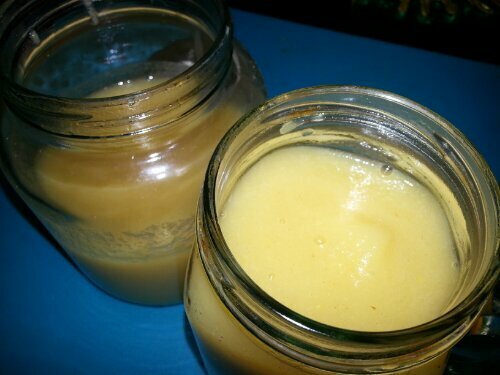 Way better than store bought applesauce! I hope you enjoy. What do you do when you’ve got a salty late night craving, but don’t want a sit-down experience? You sit outdoors and do a little people watching at Ben’s Brown Bag. Ben’s Brown Bag is an excellent walk-up spot for easy food. The staff is humble, friendly, and very welcoming. Although fairly new to the Howell Mill block and neighbor to LaFonda’s, the “Little Food Joint that could” isn’t shy about strutting its stuff on cool fall nights. The place is very simple with outdoor seating. The colors of brown, orange, and yellow remind of us a time where we would all “brown bag” our lunches at school or just bringing something to the office. Prices are a little higher than your “fast food joint,” but they have local, quality ingredients going into every food item…and you can taste the difference. I stand at the window and order the special of the day, “The Big Ben”. 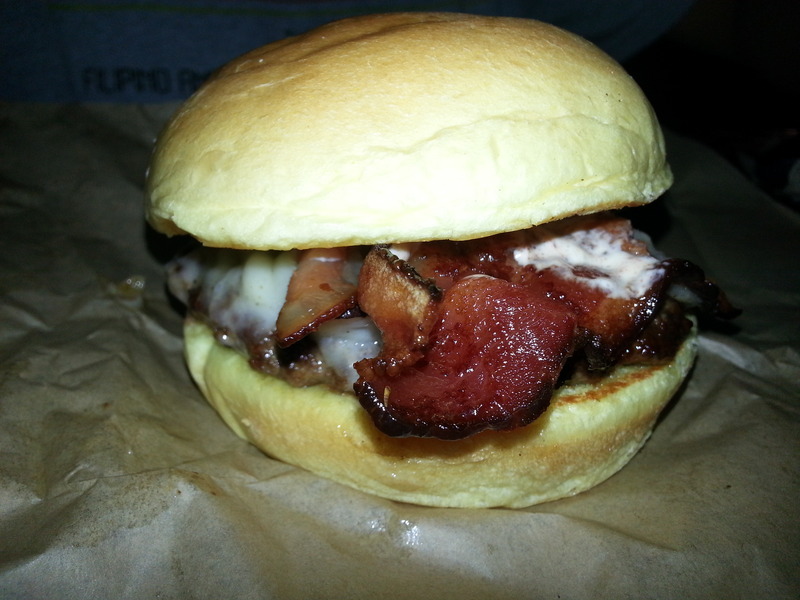 A small burger with white cheese, thick bacon, and a special house sauce is aligned with Ben’s theme. 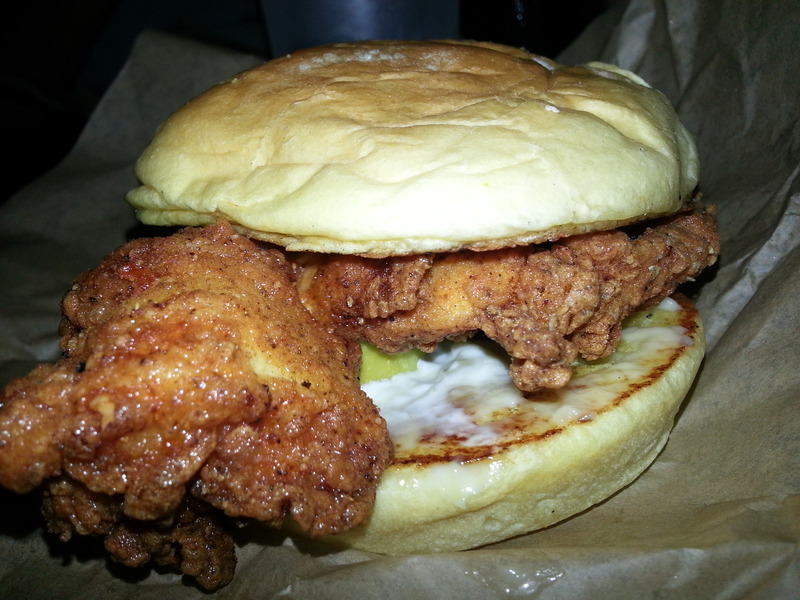 My friend (MR) ordered the popular Boom Chicka sandwich which is a marinated and lightly battered chicken breast with garlic mayo and four pickles. No skimping out on the chicken and it’s pressure fried. 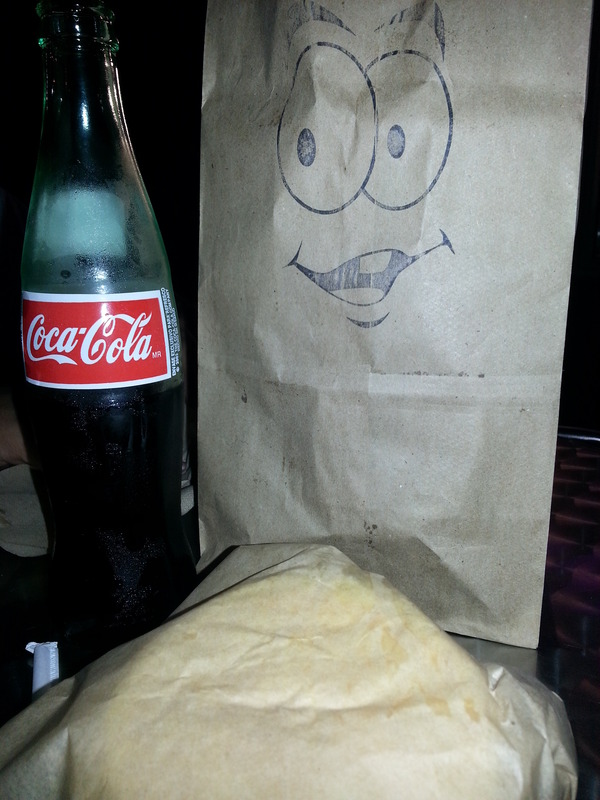 All items are served in a brown bag (of course!) with a smiley face in line with the feel and theme. One order of chips to share and an ice cold bottled glass Coca-Cola completes it all. Other drink options include other fountain drinks, sweet tea, lemonade, and Kool-Aid of the day. The brioche bun is buttery and soft. It’s more like a pillow than a foundation to house the combination of meat and cheese. The burger was cooked to perfection, medium well to be exact. Melted white cheese and thick cuts of fried bacon cooked on a flat top soaks the bun delicately without drowning it to the depths of sogginess. The special sauce is spicy, smoky and yet it’s not a chipotle type sauce. 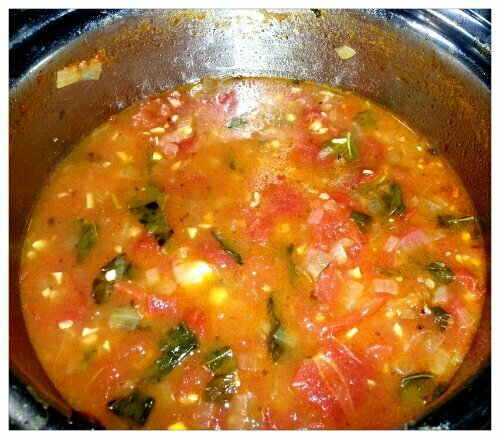 The sauce definitely kept it interesting and quite simply, “special”. Chips were the perfect complement. Who eats sandwiches/burgers without a side? I call blasphemy on those who think that is acceptable for such an abomination to happen. Chips were sliced a bit thicker than your standard chip. They were crispy, light and with just enough density at the same time. Not quite kettle chips, but crispy enough to hear a loud crunch between your ears. The potatoes were fresh and not oily at all. I guess deep-frying in soybean oil is something I can agree with. Also, the chips were lightly seasoned perfectly for sea salt & vinegar flavor (MR’s chose). Not exactly complimentary to the sandwich and Coke, but satisfying nonetheless. Other chip flavors include cajun, sour cream and onion, sour cream and cheddar. Lastly, the crowd was ratchet due to the many events in the city of Atlanta including the BET Awards (and after party at Compound), Falcons game, Braves game, “Money” Mayweather in town, unknown rappers trying to market themselves, the ladies headed to the club, and the police to “keep the peace.” Ben, the owner, was a pleasure to talk to. He gave us the background on why and how he started the business and is a very down to earth person with a passion for selling good food in the Atlanta area at competitive prices. Although the guys in front of us ordered the last shakes of the night, I’m sure we’ll be back again. 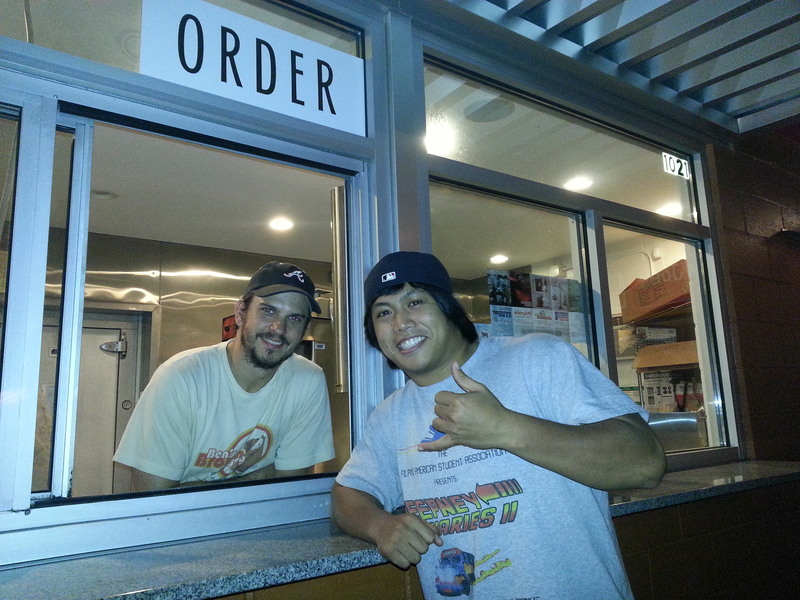 I hope his business thrives and that Ben continues to share his love of the “brown bag”. And don’t worry, the place closes at 2 a.m. Chef Liu is definitely one of the rare gems found in the crowded and diverse neighborhood of Buford Highway. Yes. Another Chinese restaurant but one to add to your list of places to visit. You may feel a bit crowded with the lunch crowd, families with young children and constant movement, but waiting for a table is worth it. Far from a P.F. Chang’s, Chef Liu has a great deal more authentic choices to offer. The people flocked in for a casual dining experience and great Chinese food. I thought this place was going to be just like any other Chinese restaurant but, found myself pleasantly surprised to be surrounded with a mix of diners from different backgrounds and that usually a good sign that the food is top notch. As soon as we sat down to check out the menu, we were given a fresh pot of green tea. 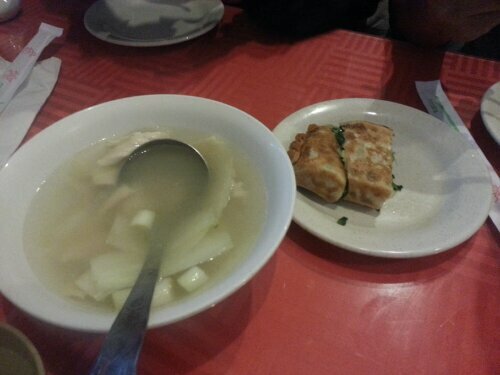 We ordered a bamboo shoot and chicken soup, but what really kicked off the dining experience was the Leek Pie. Never had I tasted such a wonderful mix a chopped leeks, green onions, rice noodles, and bits of pork inside a lightly browned pastry. The taste was clean and had a hint of salt and oil. Eating it was like chewing warm vegetable confetti that really spurred my appetite. 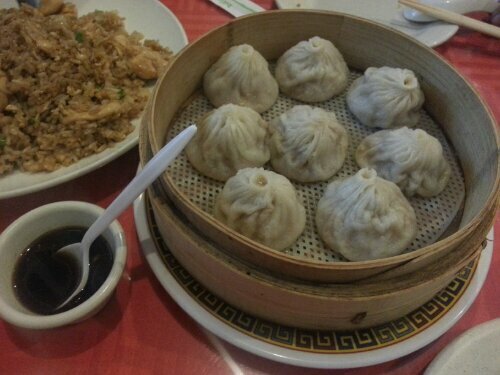 Next was something new to me: Shanghai Juicy Steam Pork Buns. Never make the mistake of trying to bite one of these in half. You will end up wearing it. Think about a pillowy, tiny balloon loaded with bold soup flavor. The bun itself is thin and chewy but disappears as the burst of soup fills your mouth. The minced pork was soft and a added a mild meatiness to not overpower the comepleteness of the bun. 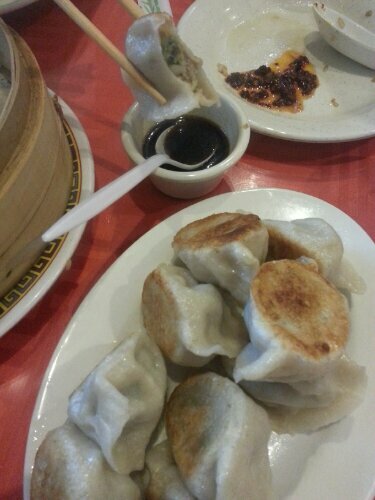 Another common favorite was the Pork Pan Fried Dumplings. These dumplings are by far the best fried dumplings I’ve ever had. Completely handmade and totally different from what you would see at a Chinese buffet or other upscale restaurant—the dough is a bit thicker than most and lightly browned on the bottom. I hate flimsy, easily broken dumplings, but the dough vaguely reminded me a delicious pastry. 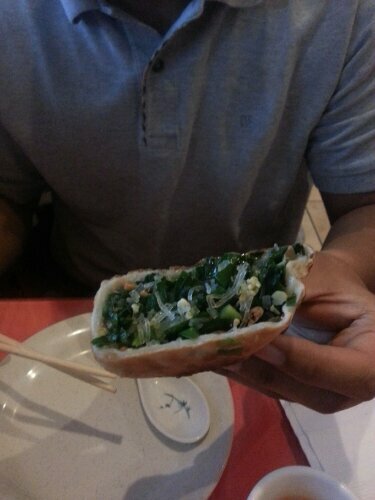 The pork inside was rolled and mixed with green onion and was velvety filling the complete inside of the dumpling. Ten aren’t enough. How could I have missed this for so long? For me, the highlight of the experience of Chef Liu was the Chicken Fried Rice. I know what you’re thinking. How could this be? It’s just rice. 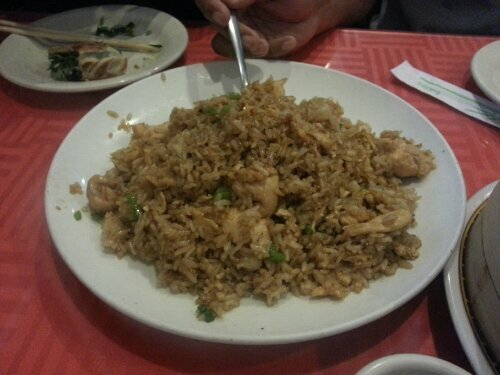 This fried rice was regular Chinese fried rice flavored with more than the “normal” amount of soy sauce, slices of soft white chicken meat, scrambled egg, and green onions. I’m so used to the regular fried rice we have (in Columbus, GA) being light soy sauced tossed nonchalantly with frozen carrots and peas along with bits of chicken and too much egg. This was seriously just a delightful interplay of flavors done entirely well. 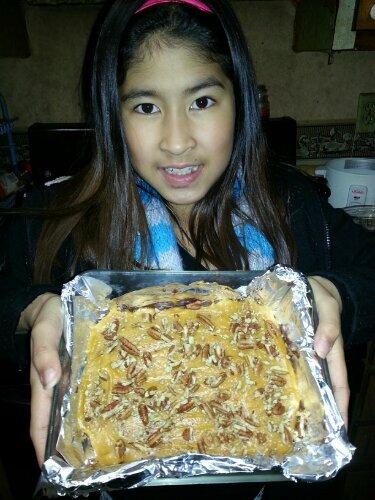 The focus was the rice and accompanied by the other ingredients. Not just another order of fried rice quickly to be served to the consumer. My experience overall was great. I like being around food places that are cheap, loaded with people, and food for all. Not forgetting to mention simple. Simple is always key. And Chef Liu has done that. Simple dishes done the right way. However, Chef Liu has done more than that. This place has brought me back to a time where gathering with my once together family huddled in a small, humble, unfranchized Chinese restaurant to get more than our fill of delicious yet simple food at extremely affordable prices. This post is brought to you by a dear friend of mine who goes by the name “Cookies.” During Cookies’ most recent visit, we checked out Chef Liu on Buford Highway followed by dessert at Sweet Hut. Why is everyone raving about kale? My first thought is, “Meh, it’s just a vegetable.” But according to this WebMD article, kale is one of the healthiest vegetables on the planet! 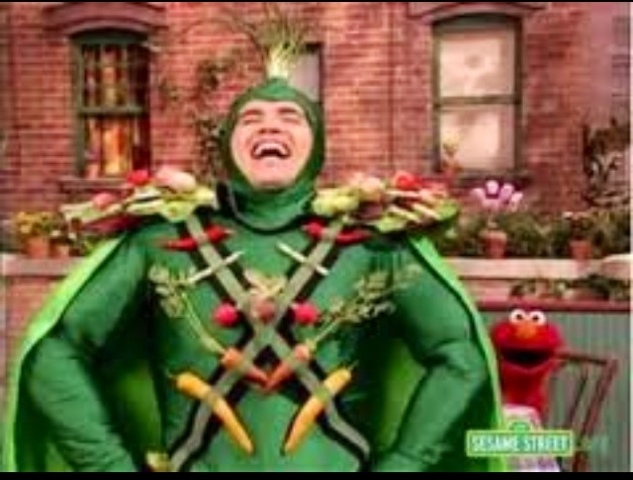 While I know several people who are or have done “the Maker’s Diet” or the “paleo diet,” I’m not quite ready for that type of food commitment and must ask, why diet when I can just eat super veggies like this? My point exactly. So, what makes kale (also known as borecole) such a superstar? Just looking at the luscious colors (either green or red) and hearty texture (that’s apparently great for stir fry), it’s easy enough to guess that kale belongs to the same family as cabbage, collards, broccoli, and Brussels sprouts in the Brassica family. On the nutrient side, kale is known for being an excellent source of antioxidants including vitamins A, C, and K. It has carotenoids and flavonoids that are specific types of antioxidants associated with many of the anti-cancer health benefits and is filled with the eye-health promoting lutein and zeaxanthin compounds: lutein and zeaxanthin . According to WebMD, one cup of kale contains 36 calories, 5 grams of fiber, and 15% of the daily requirement of calcium and vitamin B6 (pyridoxine), 40% of magnesium, 180% of vitamin A, 200% of vitamin C, and 1,020% of vitamin K. It is also a good source of minerals copper, potassium, iron, manganese, and phosphorus. After hearing several friends rave about it’s nutritious content and flavor, I decided to pick some up at my local international market. I tore off a small piece from one of the leaves, but didn’t find myself madly in love. I figured eating fresh kale the way I typically eat spinach in my salad was not going to work. While I’m not a big fan of veggies, I do love chips. 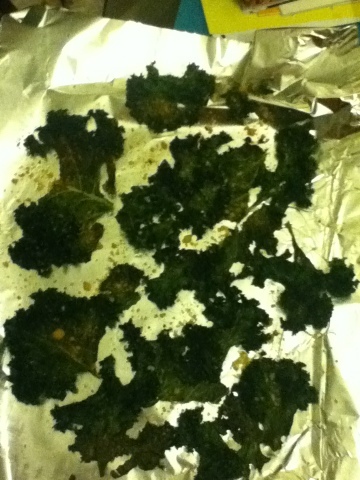 So with a little help from my handy dandy conventional oven, I decided to make kale chips! To hydrate, preheat the oven at 300 degrees. After rinsing and drying the kale, cut into edible pieces keeping in mind that pieces will shrink. Place the kale on a baking shert or foil and sprinkle with a little pepper and Parmesan cheese or other seasoning (such as chili flakes, lemon pepper) to taste. 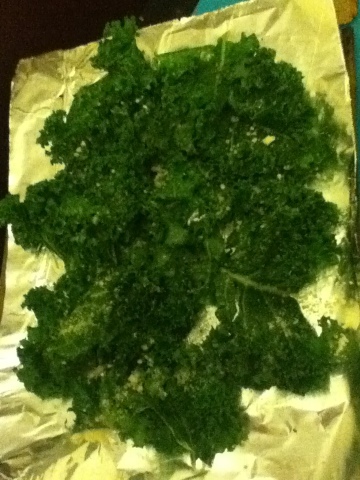 Bake the kale between 12-18 minutes or until the kale darkens. 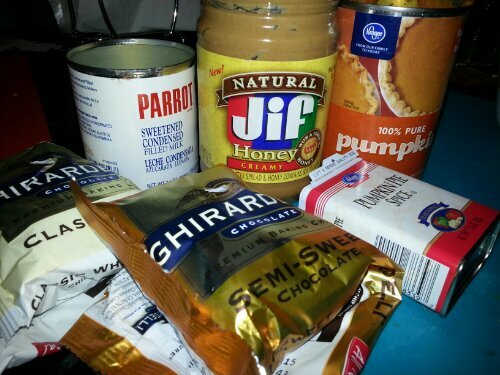 Tell me how yours turns out and enjoy! Gu’s Bistro! That’s what’s goin’ on. My co-worker and I love exploring Buford Highway and are often rewarded with great gems such as Gu’s. While I must admit that I don’t think I’ve actually had authentic Szechuan food before trying Gu’s Bistro, I am proud to check that off my list and hope to make a trip back with my friends who are always looking for a little more heat in their food. As is expected of most great hole in the walls, Gu’s isn’t a place that’s easily spotted from the road. In fact, it’s located in a strip mall just behind the Chick-fil-A. But don’t let the exterior deceive you. We started off with Chengdu Style Cold Noodles that had just the right amount of heat and really prepped our appetite for the following dishes. Listed as one of the popular picks, the stuffed tofu quickly became my favorite dish (and gave my mouth a break from the spice). 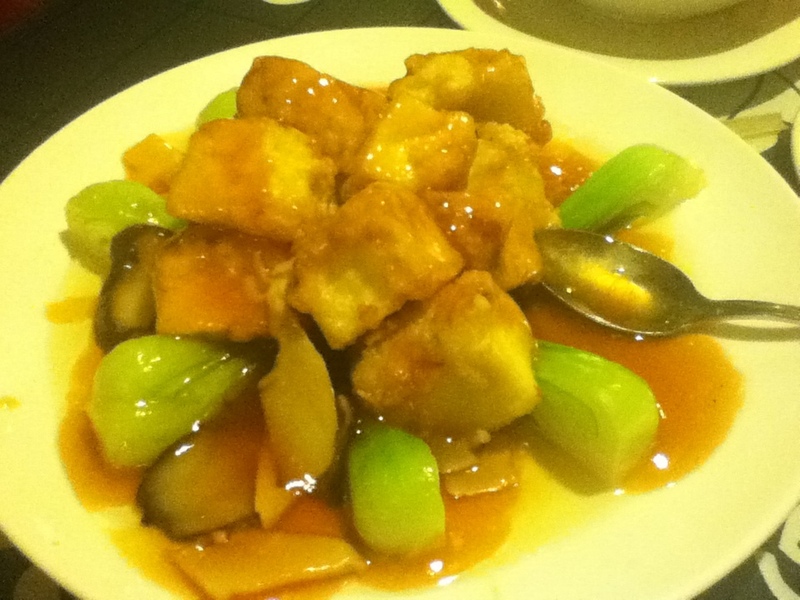 The tofu is stuffed with shrimp and mushrooms, fried, then served along with bok choy, bamboo shoots and more mushrooms. While I admit that I am not the biggest tofu fan, I couldn’t help but have a change of heart for tofu dishes after the first bite.The soft and firm tofu is pairs well with its stuffing and encased in the fried tofu. 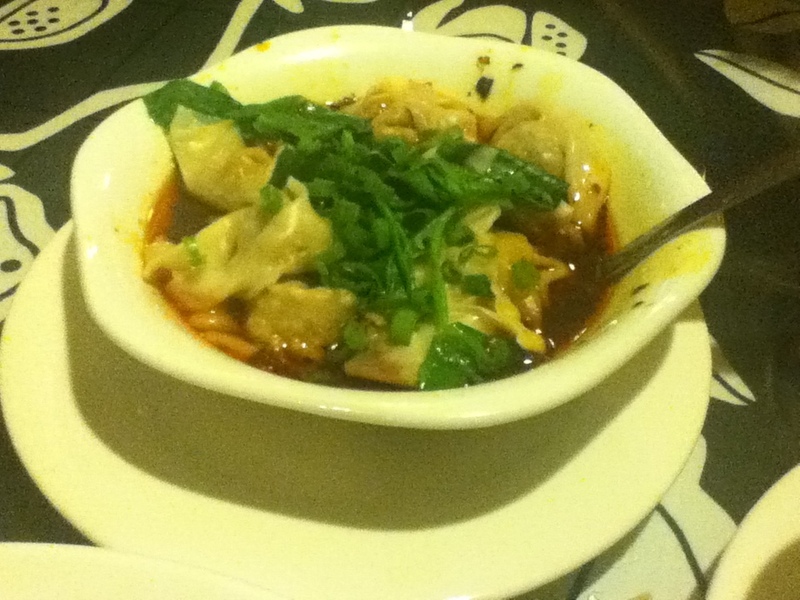 We also tried the Chengdu Dumplings served in red chili oil. Although the red chili oil is usually served as a condiment at most other places or sometimes only available upon request, these dumplings were served in a bowl of the hot liquid. 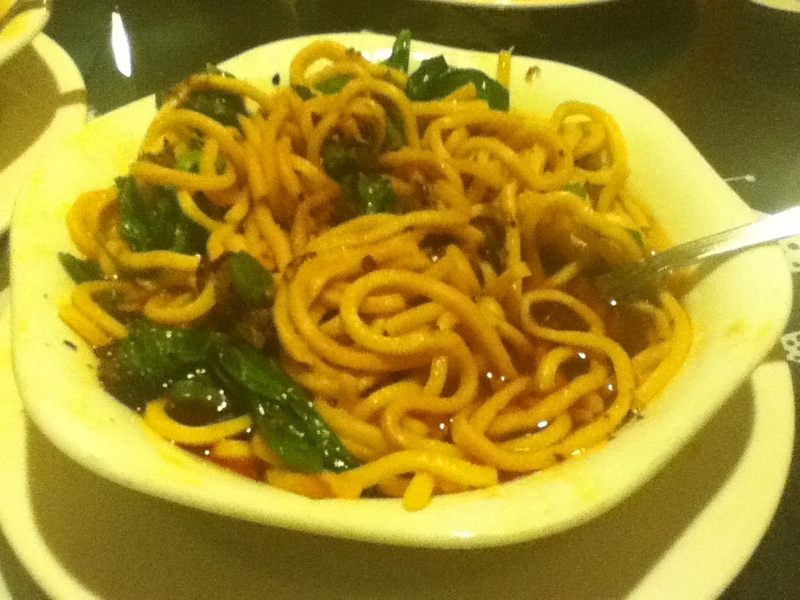 >__< But have no fear, this dish can also be served in chicken soup or hot & sour soup for milder options. Not pictured is the Cumin Lamb that is appropriately labeled with two chili peppers on the menu and cooked just long enough that the meat is soft and not chewy. Highly suggested for the lamb fans. Hope you get a chance to check this place out the next time you’re in the area!